Mary Charbonneau’s cheeks are flushed from being outside on a hot morning with the dogs. A cyclone of basset hounds circles near her feet; streams of spittle erupt from their mouths as they play-fight. After the dogs settle down, one of them, an 11-year-old named Mama, flops down in the shade beneath a tree. Mama came from a three-foot-by-three-foot concrete kennel in a puppy mill. MY PHILOSOPHY ON LIFE IS: “Care deeply enough about something to make another person mad, have passion and work hard. Stand up for yourself and others, especially those with no voice. Lend your help when able and for a good cause. Be kind to children, the elderly and animals.” These are wise words my grandmother and namesake shared with me in writing before she left this world at age 101 — I refer to them often and embrace their value. I GIVE BACK TO THE COMMUNITY BECAUSE: It satisfies my soul! Being successful is discovering what your gifts are and having a purpose is sharing them. I’m grateful for the opportunity to help homeless hounds and human beings everyday. Volunteering is a blessing and the more you give, the more you get. I WISH FOR: Greater continuing education in K-12 of spay/neuter benefits with more local grants to help reduce (and hopefully one day eliminate) pet overpopulation, plus stricter laws protecting animals against backyard breeders/puppy mills. I LOOK UP TO: My husband, Paul, for his sharp sense of the world and I give thanks for his unwavering support and gifted comic timing; animal rescuers, for they know of no living being unworthy of their time, hearts or money; our recycled pets, who, despite having rough starts in life, are gentle creatures that give us their unconditional love and devotion daily. About 10 years ago, Charbonneau and other volunteers built the yard and refurbished the accompanying house that is now the Washington Basset Rescue. Where she stands used to be a wasteland. “This was literally a dumping ground. There were cars buried out here, old oil drums, it was disgusting,” she says. Building the field and renovating the rescue house was one of the first tasks for Charbonneau to tackle for the rescue shelter. She and other volunteers spent a year working on the property, located at the end of a gravel road in an industrial nook in Hillyard. They built a room onto the house for the bassets, erected outbuildings for animal supplies, laid down ramps for the dogs to get outdoors, leveled the yard and planted grass. Around it, they erected a wood cherry-stained fence, which lends a rustic ambience. “Everything you see here was done lovingly by 10 people’s hands and dollar by dollar scrimped and saved and fundraised,” she says. Charbonneau’s love for bassets came from absorbing stories from family members who had the dogs. And that’s what drove her to found WABR, which since 1988 has rescued more than 3,000 dogs. In 1996, when she was still living in Seattle, Charbonneau adopted Bosley. When she and her husband, Paul, moved to Spokane in 1999, she began volunteering. Charbonneau says basset hounds commonly end up in shelters because, as one-way tracking dogs, they can get easily lost. For example, a basset hound can follow the wafting smells of meat from a summer barbecue, but not be able to find its way home. “They can go down, find the hot dogs and hamburgers, have a delicious meal, have fun, and then all of the sudden they go, ‘Uh oh, where am I? How do I get home?’” she says. It takes a constant stream of money to maintain the WABR and that’s where Charbonneau comes in. She’s taken the Basset Blast gathering and fundraiser — during which families bring their hounds to commune and compete for informal prizes for things like funniest name and longest ears — to the next step, procuring sponsors and adding silent auctions and raffles. 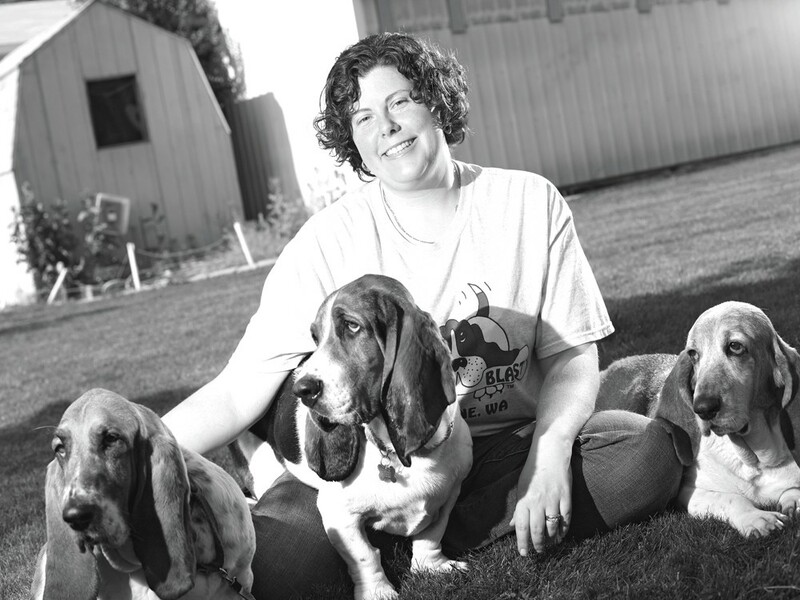 Her dedication to basset rescue has become its own cottage industry, matching, she says, the amount of time spent at her full-time job at Edward Jones. Office aside, it takes countless hours of drudgework to generate cash flow for the rescue shelter. Charbonneau spends her time driving around to pick up donations, sending fundraising letters, emails and thank-you notes and filing tax receipts. The money allows the shelter to take bassets from other shelters, even finding foster parents for the dogs of deployed military officers. The shelter also takes dogs from dying owners. Winnie, a 2-year-old basset who’s been playing at Charbonneau’s feet, is one of those. Winnie was turned into the shelter by an owner who was dying of cancer. While Winnie waddles up the dog ramp and inside the shelter house, Ollie, 2, joins Mama on the ground. Charbonneau loves helping bassets like Mama and Winnie. But just as gratifying, she says, is meeting the people helped by the dogs.